Have you ever wondered how bridges don’t fall down or how really old buildings stay standing up? In the How Do series, readers are welcome to guess along with the rest of us—and then explore the science behind the right answers. 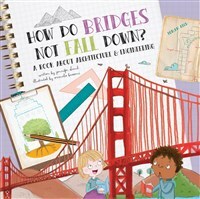 Basic principles of architecture and engineering, including an introduction to bridges, locks, arches, columns, and skyscrapers are explored through diagrams, photos, and informative and engaging text. Jennifer Shand lives in Virginia with her husband Ryan. While growing up in the Shenandoah Valley of the Blue Ridge Mountains, Jennifer voraciously read fantasy and adventure stories and had fun taking adventures of her own. Jennifer enjoys reading; going for walks, hikes, and bike rides; and traveling; but most of all she loves to write. Srimalie Bassani lives and works in Mantova, Italy. Her mother has always encourages her artistic expression, and she is the inspiration for her passion. Her work is full of surprises. She always tries to diversify her style based on every story she illustrates. It's almost impossible to remove her from her writing desk, where she keeps a stack of books and teacups of many colors.